The house at 1111 7th St. S.W. 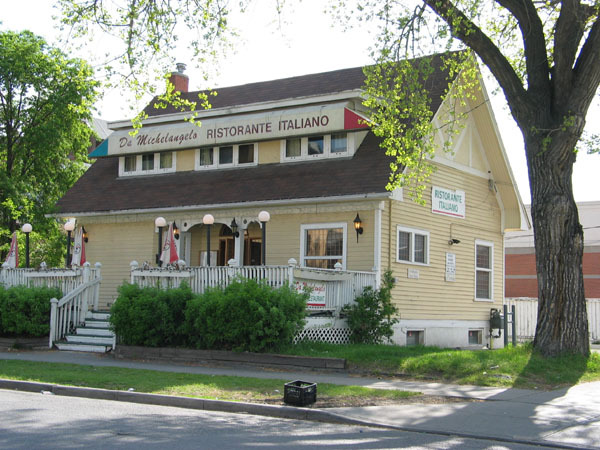 in Connaught, most recently the Da Michelangelo Restaurant, is the former home of Dr. George F.G. Stanley, an esteemed historian, educator and public figure best remembered across Canada as the designer of the Canadian Flag. George Stanley (1907-2002) was born in Calgary on July 6, 1907. His family moved into the house at 1111 7th St. in 1908. While living here he attended school, including Unity Hall at 917 14th Ave S.W. for kindergarten (the original building is part of today’s Full Gospel Church), and the new-at-the-time Connaught School starting in Grade 1. He attended the Central Collegiate Institute (later named Central High School then Carl Safran School) at 12th Ave and 8th St S.W. from 1920-1924. His memories of the Connaught district are documented in his article "School Days! School Days!" (in Citymakers, Calgarians After the Frontier, Max Foran and Sheilagh Jameson, eds. ), found online at http://www.ourfutureourpast.ca/loc_hist ... id=3602086. In a note to U of C professor Donald Smith, dated January 9, 2001, George's wife Ruth Stanley wrote that her husband, then in his 93rd year, had happy memories of being allowed to toboggan down the Lougheed's side-lawn: "Apparently they liked children and gave them permission to use the property. It was very close to the Stanley's house." Stanley was a veteran of World War II, a Companion of the Order of Canada, and Lieutenant Governor of New Brunswick. He died in 2002. His continued devotion to the West - apparent in his writings - was demonstrated in 2001 when his private library, known as the Dr. George F.G. Stanley Book Collection, was donated to the University of Calgary. As Dr. Donald Smith writes at http://www.ucalgary.ca/lib-old/SpecColl/stanley.htm, "Professor Stanley, a Companion of the Order of Canada, the recipient of twelve honorary degrees from universities across Canada, a winner of the Royal Society of Canada's coveted Tyrrell Medal for Historical Writing, has had a long and distinguished academic, military and public career. For over half-a-century his writings on the Native Peoples, French Canada, and Canadian military history, have made an important contribution to our understanding of Canada. How fitting that his library has come to Calgary, the city in which he was born, in which he went to elementary and secondary school, and which he has continually revisited over a seventy year period." The preceding summary (updated June 19, 2006) is by Dr. Donald Smith of the University of Calgary and members of the Calgary Heritage Initiative Society. Last edited by Bob van Wegen on Thu Aug 03, 2006 1:05 pm, edited 2 times in total. The Calgary Heritage Initiative Society has no objection to the addition of personal service uses to the house at 1111 7th Street SW. Adaptive reuse is important to preserving original houses in higher density mixed use areas like the Beltline. But as the house is of historic significance we do not support future redevelopment that does not preserve the house, and any renovations to the house should not further damage the historic fabric. The house is the childhood home of Dr. George F.G. Stanley, an esteemed Canadian historian, educator and public figure best remembered across Canada as the designer of the Canadian Flag. Information on Dr. Stanley and the house is appended below. The building would likely be eligible for municipal or provincial heritage designation and the related density transfer benefits described in the Beltline ARP. We ask that the City discuss such options with the owner. Happy Canada Day weekend! See above for news of the boyhood home of George Stanley, designer of the concept of the Canadian Flag. A number of Calgarians are pushing for historical designation for the childhood home of George Stanley, the father of the Canadian flag. They're hoping to have some form of heritage designation for the 98-year-old home, located at 1111 7th St. S.W., in place by the 100th anniversary of Stanley's birth next July. Stanley, who died at age 96 in 2002 after distinguished careers as an academic, author, historian and lieutenant-governor of New Brunswick, is best known as the man who came up with the design of Canada's maple leaf flag, adopted by Parliament after contentious debate in 1964. He lived in Calgary for the first 18 years of his life before moving to Edmonton to study at the University of Alberta. "The house is not on the city's heritage inventory right now. It's kind of flown under the radar for years," says Bob van Wegen, the external director of the Calgary Heritage Initiative Society. "A lot of people are surprised when they find out a Calgarian designed our Canadian flag. We want to be proactive and preserve this part of Calgary's, and Canada's past," van Wegen adds. The house has been used as an Italian restaurant in recent years and its next incarnation is expected to be as a hair and esthetics salon. "In the short term, the home's future appears to be pretty safe," said van Wegen. "But this seemed like a good opportunity to raise the issue, to bring it to the attention of city authorities before it's too late." Darryl Cariou, senior heritage planning with the city of Calgary, said once a formal designation request is received, the building will be evaluated by the Calgary Heritage Authority using criteria which include architecture, history and landmark status. "It would certainly score highly in its historic associations," said Cariou. "If it is recommended for heritage status, then it's a matter of negotiating with the building owner for designation. It's virtually impossible to designate properties against an owner's wishes." University of Calgary history professor Don Smith says Stanley played a significant role in both making and chronicling Canadian history. "A plaque honouring Stanley on the home would certainly be welcomed, but declaring it a heritage building would be wonderful," says Smith. "I sense Calgary was always close to his heart although he lived in a number of other parts of the country," adds Smith, noting Stanley wrote vivid accounts of his boyhood years attending Connaught and Central Collegiate (Dr. Carl Safran) schools. Smith says Stanley authored definitive histories of western Canada and held a special passion for Louis Riel. Stanley's widow Ruth, who was in Calgary recently, said he often regaled her with tales of his boyhood in the burgeoning prairie town. "There always seemed to be a perpetual hockey game going on on the street in front using a frozen cow pie as a puck," Ruth recalls with a smile. "And his father and George conducted target practice in the basement of the house with their guns." Ruth said flags seemed to play a pivotal role in George's life from an early age. "They always had a (Red) Ensign flag outside this house, but George never felt it reflected Canada's reality," she adds. By the mid- 1960s, many Canadians shared Stanley's restlessness for a distinct symbol to call our own and the government of Lester Pearson launched a committee to seek design submissions. Stanley was serving as Dean of Arts at Royal Military College in Kingston, Ont., and took the college's flag as part of his inspiration. With a red pencil and a ruler, he sketched out his concept on the bottom of a March 23, 1964, letter to MP John Matheson and the rest is history. Ruth said George had a clear vision of what Canada's flag should include. "Red and white was a must. It had to be distinctive and visible from a distance, something that stood out against backdrops like water or snow. And the maple leaf had to be stylized, not intricate, something that school children could draw," she adds, sitting on the steps of her husband's boyhood home in the early morning sunshine. Some at the time of the great flag debate were pushing for a beaver instead of a maple leaf as the focal symbol. "But we always thought a beaver would look too much like a rat from a distance," Ruth says, smiling. When he got the phone call that his design had been accepted from hundreds of submissions, Ruth said George was "quite shocked." On Feb. 15, 1965, George Stanley's design became Canada's national flag. "We went to the top of the Peace Tower. It was absolutely stunning. Ottawa was awash with flags," Ruth says. Soon after they were married in 1946, George Stanley brought his new bride, a Montreal girl, out to see his foothills hometown. "I don't think the city and the mountains ever got out of his blood," Ruth says. "He surely loved Calgary." In recent months there were plans to turn the Stanley house (see above) into an Irish pub, but those plans fell through and as of December the house is on the market again. Below are links to the brochures for Sale and Lease. See above ^ for media stories and other news on the Stanley house and the redevelopment thread. National Flag Day is February 15!